Semiconductor counters had a good run in 2017, but few have been able to continue the climb in the first half of this year on concerns over the US-China trade war and the strengthening of the ringgit against the greenback. 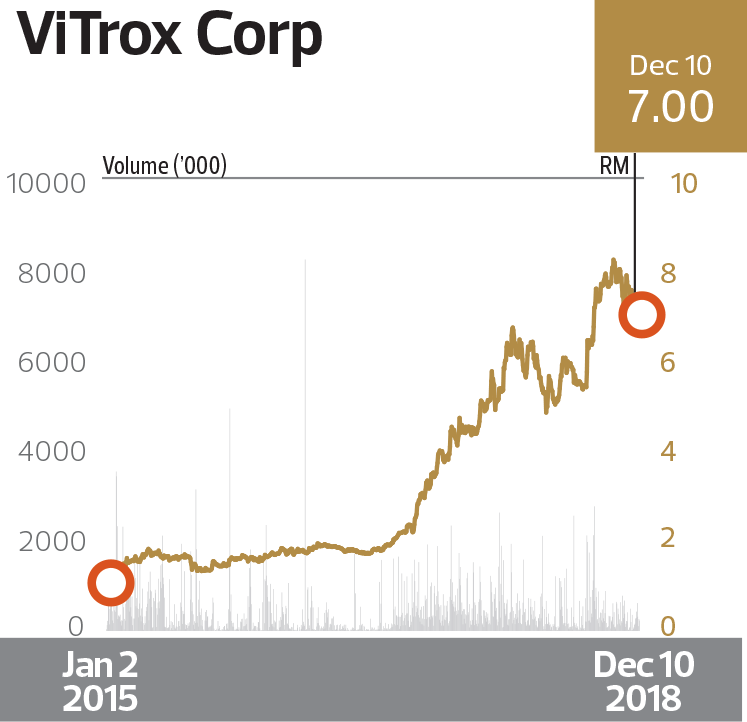 ViTrox Corp Bhd, which joined The Edge Billion Ringgit Club last year, has been able to sustain the upward momentum of its share price, which has soared nearly 235% in the past three years, from June 30, 2015 to June 30, 2018. The gains translate into a 50.41% three-year compound annual growth rate. The rally has gathered steam from the company’s sustainable earnings growth amid increasing demand for semiconductor inspection. ViTrox achieved record revenue of RM327.5 million for the financial year ended Dec 31, 2017 (FY2017). The impressive jump in revenue was attributed to its increased market share in some growth areas — including China, the US, the Philippines, Taiwan and Europe — for its new and improved series of inspection systems and equipment, serving the growing semiconductor back-end and the electronics manufacturing industries. In FY2017, ViTrox launched new advanced vision inspection solutions to cater for the increasing complexity and miniaturisation of semiconductor components, allowing automatic identification of defects via its 2D and 3D optical and x-ray vision inspection systems. Its all-time high revenue for FY2017 marked a 40% year-on-year jump from RM234.03 million in FY2016. Its FY2017 net profit grew 28% y-o-y to RM83.02 million. The group said the global move towards more connectivity and artificial intelligence will drive the demand for more smart electronic devices and equipment, powered by advanced semiconductor chips and sophisticated electronics systems, which augurs well for the group. Since FY2013, ViTrox has more than tripled its revenue and plans to further grow its top line with the development of new technologies as well as expanding its product offerings and market share. In terms of rewarding shareholders, the company paid a dividend per share of five sen in FY2015, 6.5 sen in FY2016 and 4.5 sen in FY2017. For the three financial years, ViTrox shareholders received a total DPS of 16 sen. The sustained share price rally and regular dividends have made ViTrox the clear winner of The Edge-BRC Highest Return to Shareholders award for the semiconductor sector. This is the second year in a row that ViTrox has come out tops. The company’s earnings growth continues in FY2018. ViTrox posted a net profit of RM76.03 million, a 22% y-o-y rise for the nine months ended Sept 30. Cumulative revenue expanded nearly 23% y-o-y to RM284 million. According to Hong Leong Investment Bank analyst Tan J Young, ViTrox expects to post another record year for FY2018, based on its increased floor space and additional tax incentive. Tan says the group’s automated board inspection segment remains ViTrox’s main growth driver, offsetting the slack in its machine vision system tray operations. “Despite the sequentially flattish 3QFY2018, business prospects remain bullish while Campus 2.0, with more floor space, allows ViTrox to take more orders. Recently, its pioneer status was extended to include ‘sales of related module’ which are related to upgrade services,” says Tan. He adds that the group is poised to win more market share in the event of global semiconductor growth, leveraging its technology leadership in machine inspection, especially in 3D automated optical inspection and advanced extensible interface. Maybank Investment Bank analyst Ivan Yap says ViTrox has yet to unleash its full potential. “ViTrox has yet to fully utilise its new Campus 2.0 and we expect earnings growth to persist as it benefits from rising demand for automation equipment, especially in the telecommunications infrastructure (5G deployment from 2019 onwards) and automotive (autonomous driving) industries,” Yap says.